Scaroina said his coloring is deliberate and metaphoric, and each number, letter and form holds symbolic import. Some allusions can be as simplistic as the birth date of a significant person. You have to stand close to the canvases to detect newsprint beneath semi translucent layers of paint and latex, but each printed article was chosen for content. 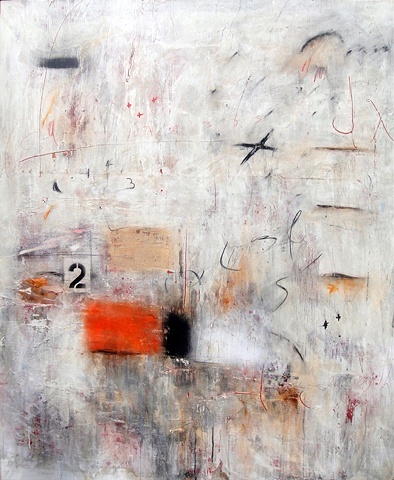 Alfredo Scaroina, Composición #021, 2012, Acrylic, Oil, Charcoal, Graphite, Black Gesso, Spray Paint, Synthetic Polymer, Archival Newsprint on Canvas, 60" x 48"
Glyphs and geometric forms that symbolize human thoughts and experiences, Scaroina believes, arise from the subconscious, and simultaneously reside in a universal domain where they are accessible. Marking the canvas he told me “connects me with the viewer.” He spoke of “indivisible unity” and also of "collective consciousness." I asked him if he meant those words in the Jungian sense, in which all humans share certain archetypes. “That is precisely how I intended it, in the Jungian sense,” he said. Integral to this metaphysical concept is the idea that the artist proceeds ritualistically. As energy enters the emblematic space, the creative act becomes a form of magic. It’s been well documented that Mondrian and Kandinsky had mystical leanings of this sort. So did Beuys and Basquiat. Many contemporary artists equate their art making to shamanism and divination. Anselm Kiefer, who weirdly exorcised German history, and David Hammons whose wine bottle sculptures bestowed blessings on street people, immediately come to mind. During our talk Scaroina entered unexpected territory when he said, “all emotions or states of mind at a specific moment, are translated into 'matter,' into visual matter, consummating the concept of Matter as Art.” English is not Scaroina’s first language and he apologized for any improper usage, but it’s certain here he veered into the subject of quantum physics, which leaves open the possibility of perception influencing matter. Seeing the manner in which his hieroglyphic ideogramattic markings and colorful distorted geometric forms pulsate with energy and float sensually in organic layers of paint, makes intuitively valid associations with time, matter, multidimensionality and particles. 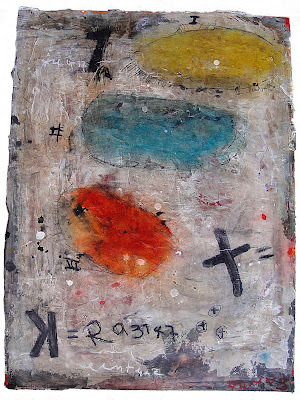 The exhibition’s title, “Taming Matter / Domando la Materia,” reinforces my intuition. Although we did not discuss it, there might be another component driving Scaroina’s art: Vedic philosophy. According to Hindu scripture, all in the universe - humans, the cosmos - are of the same spiritual essence, and with contemplation can be psychically linked. The individual soul is identical with the universal soul, the Upanishads tell us. Scaroina’s art seems to voice precisely this type of interconnectedness. 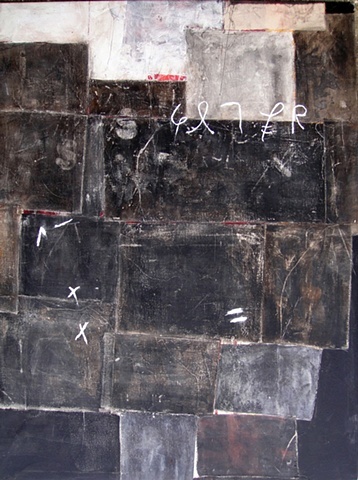 Alfredo Scaroina, Composición #6, 2012, Acrylic, Charcoal, Black Gesso, Synthetic Polymer, Graphite, Metal Dust, Archival Newsprint on Canvas, 24" x 18"